You knew somehow it was going to happen. You knew the tale of the two Alex’s would Somehow somewhere rear its mysterious wonder sometime during this New York Yankees and Tampa Bay Rays series. I was praying the moment I saw the second Alex warming up in the Bullpen that the proverbial Joker would not ruin this storybook ending. 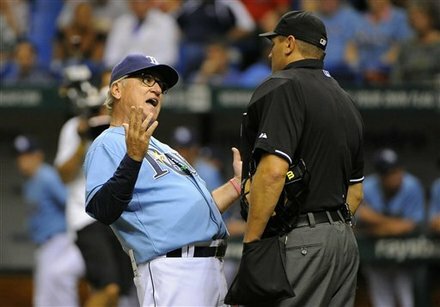 Most of us in the Rays Republic have grown accustom to the odd and sometimes mystic ways of Rays Manager Joe Maddon. We no longer question in advance the madness or insanity because of his overall check mark firmly entrench on the Winning side of the odds ledger. But during this Nationally televised contest his pair of mirror image Aces were beaten by a Jack of all trades (Nick Swisher). I could see Rick Sutcliffe doing his voodoo trance of death from my Rightfield seat. 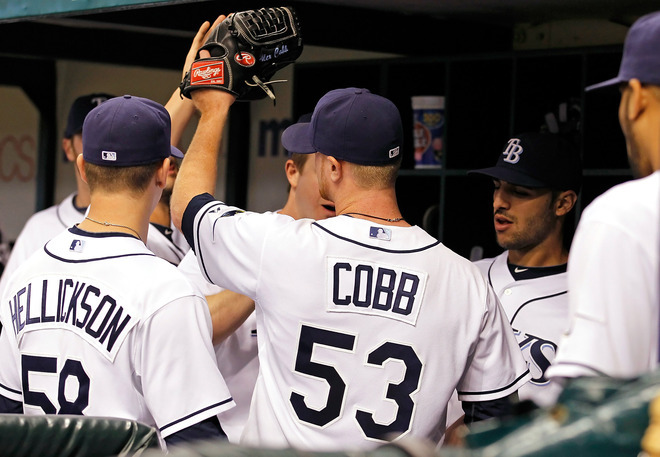 It was the story of one Alex (Cobb) who fought through a flaw of tipping off his pitches during his M L B debut in a spot start against the Los Angels Angels at Tropicana Field to posting a 2-0 record on 5 starts this season for the home club. Cobb performed superbly in the contest putting his own spin on thew game, keeping the New York Yankees basically in check with his pitch selection leaving the ballgame in line for a “W” after posting a 4-2 cushion for his Bullpen. t looks almost like a certain thing Cobb would post to an impressive 3-0 record. Some how the usually solid and aggressive Rays Bullpen issued 5 walks and saw their usual rock of Gibraltar, closer Kyle Farnsworth crumble. Farnsy has now surrendered 5 free passes in his last 5 appearances, which included his 3rd blown save on Monday night. Then suddenly the second bookend Alex (Torres) who was making his M L B debut got a chance to leave a impression not only on Maddon, but on the assembled Rays crowd. Scouts had been more than vocal that Torres might not be ready for his shot, but the Rays took the gamble on their pair of Alexs’ on this night. When Torres took the hill during the top of the 9th inning, he looked confident, polished, possibly having something to prove not only to himself and his team, but to his new pinstriped adversaries. Torres threw 44 pitches on the night, the first 7 to lead-off hitter Curtis Granderson, a hitter who is not an easy task even for a veteran. Torres did get Granderson to a 3-2 count before Granderson fouled off the next 2 offering. Then Granderson delivered with a single to Center. Next up power hitter Mark Teixera. Another guy who with one swing could change the outcome of the game and send the Rays Republic home wondering “What if”. Torres seemed more poised, controlled as he got Teixera to strikeout swinging on 5 offerings. Suddenly maybe Alex #2 had some M L B moxy. Torres never worried about Granderson, and he quickly stole second, moving himself 90 feet from scoring to put the pressure on the Rays. Mariano Rivera was now up and throwing over Torres right shoulder, he glanced down the foul line then threw a nice breaking pitch to Robinson Cano that he grounded to second for an easy second out. Suddenly it looked like Torres had a reliever’s mindset. Maddon then sent in the signal to Intentionally walk Nick Swisher with Granderson 60 feet from home plate. Runners on the corners with 2 outs. Andrew Jones then saw only 5 pitches before he walked to first loading the bases with pinstripes, hyping the pressure and room for error into the red. Martin came to the plate with the intention of ruining Torres debut. It was nothing personal, it was the way the game is played. He took the first offering from Torres and heard the deep bellow of Home Plate Umpire Ed Hickox as the ball nipped the corner. Then Martin saw 2 straight balls in the same area, but this time outside the zone, but always hoping not to hear another called strike from Hickox. Torres gained some ground on Martin getting him to a 2-2 strike count before the momentum quickly turned in Martin’s favor. 2 of Torre’s next 3 pitches missed their mark. Bringing in Granderson from Third, posting a 5-4 lead for the Yankees. Immediately a lot of heads went down in the assembled crowd. Somehow we all knew the result. We all collectively knew that the gamble by Maddon had been called, dealt with and the cards were in the Visitor’s favor. Even Torres seemed to give in a little as the next hitter Brent Gardner got off to a quick 3-0 count before Torres reached down and fought back to a 3-2 count before Gardner hit a roller to Longoria for the final out of the inning. Almost instantly the second guessing in the stands began as people questioned the Intentional walk to Swisher, but even as people bickered and threw their arms up in wonder, the Rays never seemed to get over that half of an inning, getting contact on all three at bats in their half of the inning, but going down 1-2-3 to end the night. 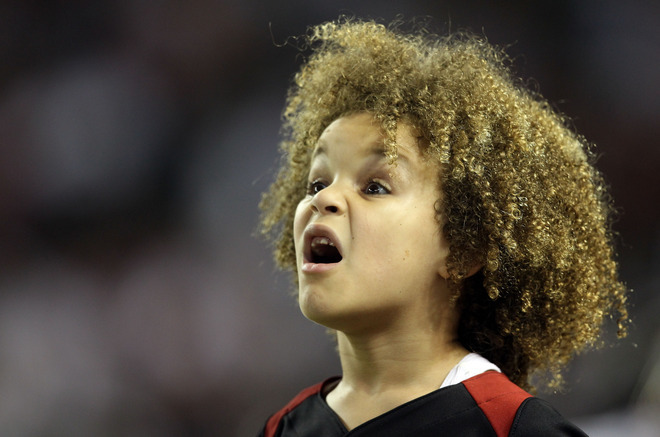 Suddenly Torres was being labeled in the stands as the “second coming of Jorge Sosa”. 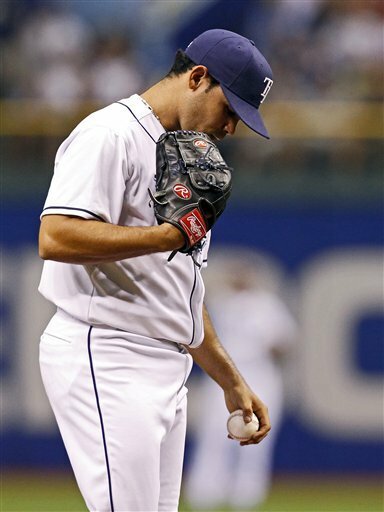 Or that he reminded some of former Rays RP/SP victor Zambrano who had a World of potential and velocity, but his control was all over the place. Both of these resemblances were unfair, but had a hint of merit. That night Torres was informed he was going back to Triple-A Durham, but even with a perfect night his stay up with the Rays might have been short lived. You know the Rays sent Torres back to Durham with a “To Do” list of things to work on, things to get right, and progression might have us see him again in September. Both of the Alex’s were total opposites on this night. Beside Cobb being a right-hander and Torres a leftie, that is were their similarities ended, even on Monday night. When the 9th inning began and Torres was popping the mitt with his warm-up pitches. I wanted the storyline, the “Tale of the Two Alex’s” to have a glorious ending. A way to celebrate this rookie invasion that has been so successful for the Rays, but Swisher, a Jack of all trades had his own fairy tale ending in the works. 7 Games Does A Season Not Make. The media’s “doomsday” prognosis that the Tampa Bay Rays have to come away in this 7-game home stand with a positive mark might just boarder on the extreme. Sure they are facing two of their bitter rivals in pivotal contests that could decide the fate of any of the three come October. With the Rays sporting a .500 ( 19-19) record entering this first Friday night contest, there is a push for the team to again show some dominance within their home dome, but winning does eradicate any sense of impending doom and erases late season doubt from the present equation. early projections. Now would be the perfect time for the Rays to exorcise a few past demons at Tropicana Field and thrust their might upon their high profile behemoth opponents. Some might say it is the right time to face these demons of the A L East with injuries and inconsistent play dominating their results. But these squads also had a few days off, like the Rays and might have caught their proverbial second wind. Doesn’t matter that the Rays are throwing their Top 3 at the Red Sox to begin this series, wins trump everything. Right now, wins within the Teflon Trop are at a premium, and with a Nationally baseball audience watching the Rays from Saturday to Monday, winning also sets up the rest of the country in believing in this Rays squad. 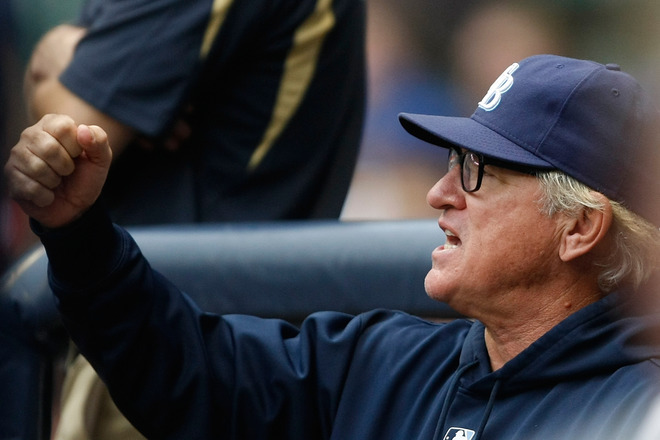 Doesn’t matter what mental edge, elegant soliloquies or presence Rays Manager Joe Maddon expresses here, the end result on the scoreboard will be paramount. A 7-0 perfecto home stand mark not only thrusts the Rays second half home field advantage firmly into the mindset of every squad, including the Yankees and Red Sox, but also into the skulls of those teams that venture into the re-vitalized Trop. Conjuring up images of impending losing results instead of the possibility of a fistful of wins before leaving the Trop could play a great mental edge for the Rays if they are successful in this hoime stand. Paramount to the Rays future right now is re-establishing their home field edge, their proverbial “10th Man” advantage that has been fleeting at best in 2011. Large crowds during this series will be speckled with red, and pinstriped fans, but the loud and musical Rays Republic has to answer the call. They have to bring their “A” game if they want to again experience post season magic in 2011. 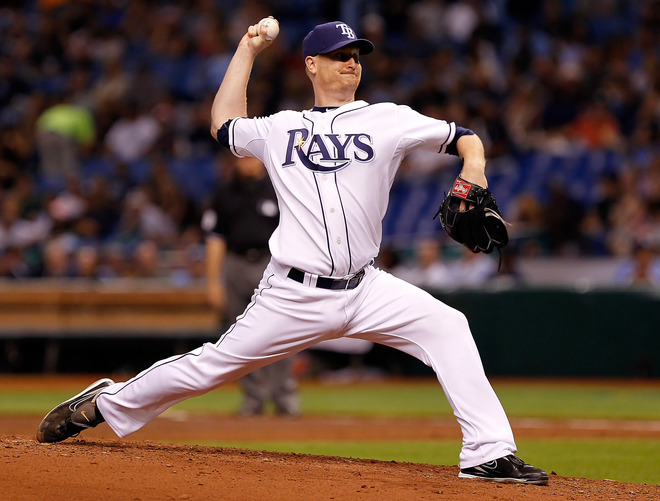 A 4-3 split might only help the Rays creep a game up on either the Red Sox or Yankees. Combine that with the Rays 1-2 record against the Yankees at the replica Yankee Stadium, and you get a feeling of urgency right now to win. Winning is a fickle thing. You can have a clear advantage and still get shut out or even go down in a stunning defeat. If you stare it right in the face and go aggressively towards defeating your opponent, the odds do favor you. That is the true key to coming out either as winners or losers in this 7-game showdown. Sure winning is the wanted result, but having this Rays team begin to steamroll, to show their aggressive nature both on the hill and in the box will decide not only these 7-games, but their post season future. 7-games does not a season make, but these 7-games could decide so many people’s thought processes surrounding the Rays immediate future. This is not a “doomsday” prognosis, this series does not have a “Do or Die” stamp firmly upon it yet. game, not just in a 7 day stretch? 162 games is a long time, but to condense this madness into a single 7 game set and not over the course of the combined 36 games between the Rays and these two high dollar darlings just seems like the media’s own madness. Winning the seasonal series, posting up and throwing losses on these two traditional powers will go a long way in deciding the Rays future……not just 7 games. 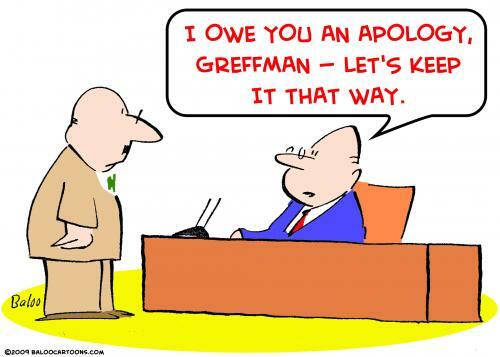 In the end winning trumps losing…..But that doesn’t sell newspapers as much as drama. Let’s keep the drama in afternoon television, not around my Rays. Since we are sitting at the conclusion of the 2011 All Star Game, possibly this is a good time to make a change. To again try and provide the type of regularity and style of writing you have all relished or at least gazed at since I first wrote here on November 2007. My life away from the clay and turf has changed dramatically, and I left my Tampa Bay Rays baseball firmly in the darkness in my internal cranial closet. Every since the Rays Spring Opener in Port Charlotte, Florida on the last day of February, my life has been a whirlwind, but in a good sense. Got to make a trip of a lifetime across the California coast, through the Arizona and Texas desert, wandered through the streets of the Big Easy until finally seeing the rural decay and loss of Old Florida as I took US 19 south to my home instead of flying 75 mph along a concrete Interstate system that hid all the change. From that 6-day trips conclusion, things either went silent or changed quickly. Celebrated another birthday at Tropicana Field with a loss ( 0-12 lifetime), traveled throughout this region, to Boston, Grand Rapids and even beyond driving by places like Bonnaroo, the “Batman” building in Nashville and experiencing the hustle and terror of the George Washington Bridge heading into the Big Apple. Work brought a quick change to the fact that before the 2011 season began, I had personally attended 161 of the Rays 162 homes games spanning the 2009 and 2010 seasons. 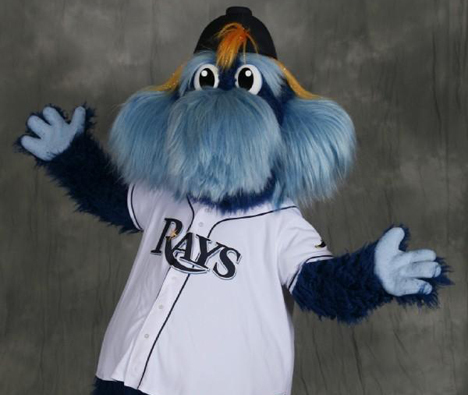 I left behind a seat I have conformed to my bottom, a sense of baseball stability, lost my true Rays identity for a bit. My writings have shown a lack of Rays enthusiasm ( except for the concert events), and that is done. Because of my travels I lost visual and physical contact with the team I had grown so attached to it was silly. I no longer spoke to my Bullpen friends, talked to other fans about concerns and have only made a handful of actual Rays games in 2011. Since my accepting this job, I have driven over 30,000 miles since March 2nd, and enjoyed every moment. Exploring places I visited in my youth, or finding new wonders that escaped my imagination and glee. That changes today. This is the benchmark moment where again I am going to try and get within reason of my New Year’s Resolution again of writing something every day. 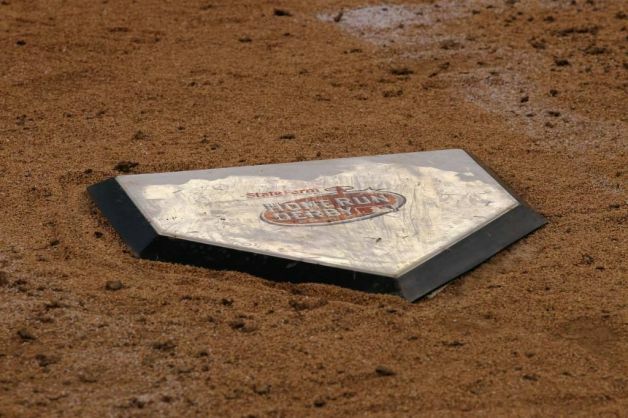 I did not purchase my 2011 Rays Season Tickets knowing my travels would instantly gouge into my Rays passion, but I never expected it to be dammed up and trickle to a minute flow on my blog. Starting on this same day when the Rays players again circulate within Tropicana Field getting ready for the “second coming” of the season, my Rays writing rebirth will commence. There has been so much Rays information swirling within my cranium, so many tales and observations that I have pushed down that will now burst forward. Within the confines of my new humble abode (tin can), I will thrust this laptop open daily, produce something, even if it is only 100 words about this great sport. I even fought within myself for the last few weeks about leaving the Rays Republic and writing with a broader pen stroke about all of the baseball World. That idea has not been squashed, but it is being held in reserve, possibly for the future. But my heart is with my hometown team. 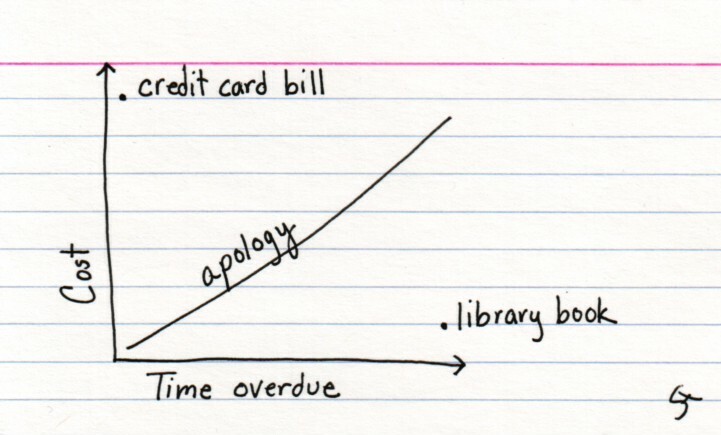 Those who subscribe to my blog, I apologize for the move away from my norm. 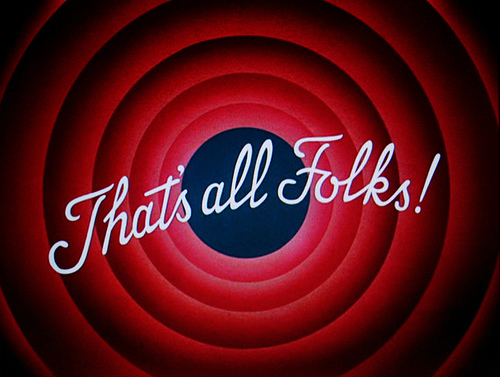 To those who stroll by on occasion, I am sorry if the content went South and the frequency erratic. This Thursday, July 14, 2011 is the second coming of the Renegade. It is not a symbol on the Chinese Calendar ( should be), and is not a monumental event outside the realm of my blog, but it is a big step forward again towards regaining my sense of Rays worth. From the casual Rays and baseball fan, to people within the Rays organization who glance upon this page, today is anew with vigor, vitality and hopefully more insight into a World I shunned for a short while. 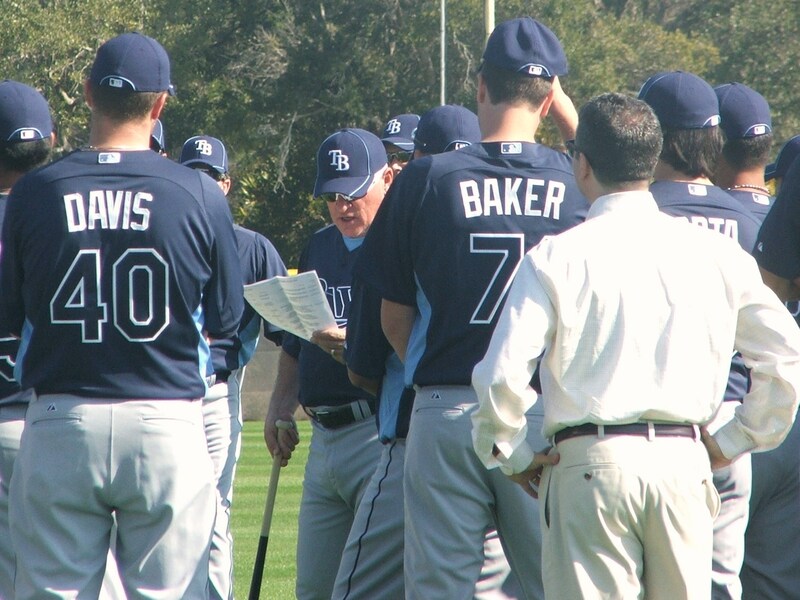 Funny how unpacking moving boxes filled with Rays goodies, jerseys and photos have reminded me of what I am losing out on, of what pleasure just writing about this team used to well up inside me……Well, I’m back…….Hope you invite me into the Rays Republic fold again. Everyone might remember I had some reservations on the new “Captains” format for the State Farm Home Run Derby. 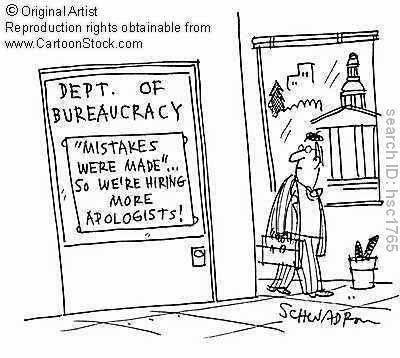 After thinking about it for a day, it might have some legitimate merit, but maybe it can be tweaked a bit, just like the selection process. Hopefully today I can outline my ideas, and maybe some day M L B will take credit for it ( just kidding). 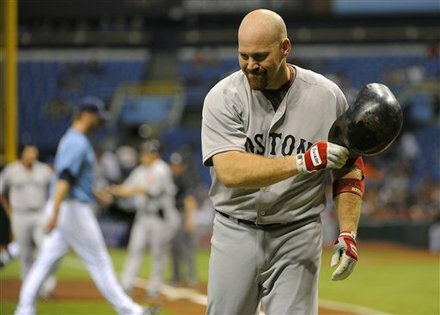 The Captain format did take the selection process out of Major League Baseball fingers, but it ended up being a collection of “buddies” taking turns hitting a baseball more than a competition that let fans from all over the country, and other countries outside the United States see our budding stars. Sure American League Captain David Ortiz made an overall very impressive four-some, but even Ortiz made sure to mention several times that he picked his “boys”. So why not make the American League and National League leaders at the All-Star Break the Captains in the future? That would give more of a guarantee to the assembled baseball fans the best long ball hitters from both leagues at the top of the equation. In 2011, that would have made Toronto Blue Jay Jose Bautista and St. Louis Cardinal Lance Bergman the first 2 players selected for the Home Run Derby. Combined the pair have crushed 55 balls into the stands heading into the All-Star Break. From there I would love to trash the current “Final Vote” premise and re-institute it with 8 names from each league to have a week’s worth of voting to decide the final 3 candidates to stand with Bautista and Bergman as members of both the American and National League squads. Sure there is still the horror of the large market teams stuffing the ballot box, but I have a solution to keep multiple players from each squad off the final selection team. To keep the Red Sox, Yankees, Cubs, Cardinals and possibly the Dodgers from stuffing the ballot boxes, there can be no multiple players selected from the same franchise. That ruling would have split up the 2011 pairings of Adrian Gonzalez and Ortiz, plus would have made either Rickie Weeks or Prince Fielder the Brewer possibly selected to the team. This rule would have also eliminated Matt Holiday since Bergman would have been the Cardinals representative. Such a regulation would keep an unbalanced Home Run Derby squad that should of included players like Cincy’s Jay Bruce, White Sox Paul Korneko, Ranger Nelson Cruz or even Oriole’s Mark Reynolds. This system also has a flaw or two that need to be ironed out, like this year’s winner Robinson Cano might not have been picked with this format since Mark Teixera and Curtis Granderson had more Home Runs heading into the break than Cano. Sure there are thing to be worked out, and holes to fill by players not wanting to participate, but M L B could get those “Yeahs” or “Nays” at the conclusion of the All-Star voting and hype up the Home Run Derby selection process with an entire week of plugging certain players, or maybe even trying to get a up-and coming player most of the country has not seen hit the ball like the Marlins Mike Stanton a chance on the big stage. M L B made an honest effort this season to correct some past Home Run Derby wrongs, and they are steps in the right direction. 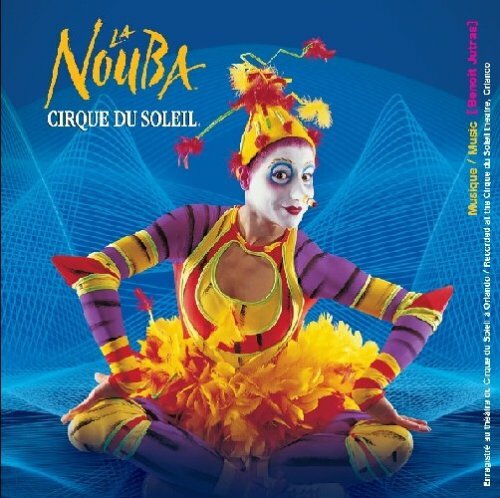 Now by also involving the fans in the process, we can get a more suitable and diverse selection that will have people again excited about the event. Watching Bautista and Weeks struggle last night was painful at times, and there is no doubt some people changed the channel……With a few slices and dices, the Home Run Derby can come back in Kansas City for the 2012 All-Star game lean, mean and pounding balls after ball into those fountains. That would be a pure joy to watch. 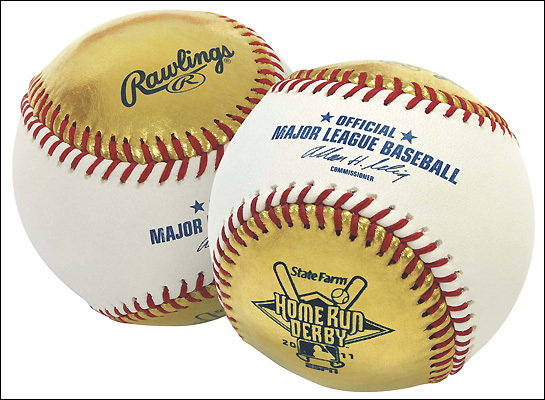 From spinning golden orbs to a basic “pick me” format for the participants of the 2011 State Farm Home Run Derby, Major League Baseball has tried to bring a few more entertaining and exciting ideas to the forefront for their showcase Mid-Season Classic. But like a sharply hit ball down into hardened clay, M L B has committed at least one error on the play. 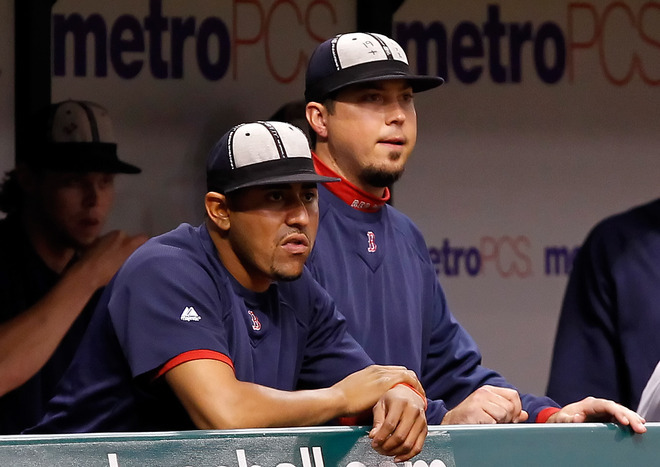 By deciding to appoint two League Captains, Brewers Price Fielder and Red Sox David Ortiz, it was thought the process might instill some added excitement. Instead it is ended up looking more like those dreaded “pick-Me” games we all experienced as kids on the Nation’s sandlots. Cliche’s do form within Leagues, and that apparently has made it way into the hallowed H R Derby. Sure the team’s picked have power, resilience and even a bit of history competing in this event, but some elements are missing, like a hometown guy getting a chance to impress the home folks. Several years ago when the game was in St. Louis, Albert Pujols held court and brought the entire Nation into his love fest. Why didn’t Fielder possibly pick Diamondback Justin Upton as a Home Run participant, he does have the swagger and swing to line up against this bunch of competitors. 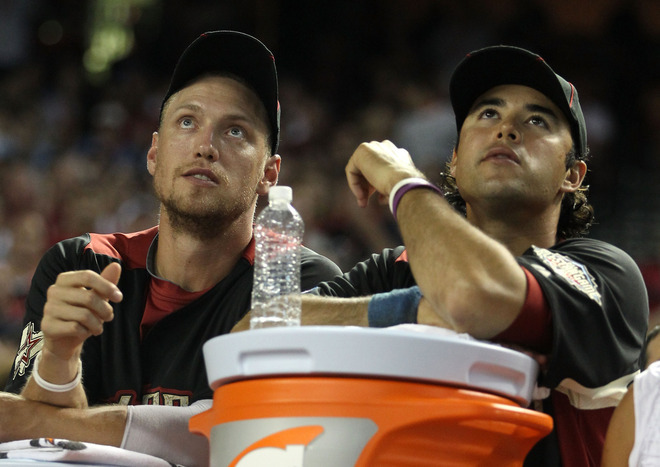 Shouldn’t D-backs star Upton get the same hometown privilege? If you look at the scheduled teams, from each League, more than a few “friendships” seem to creep into the selection process. 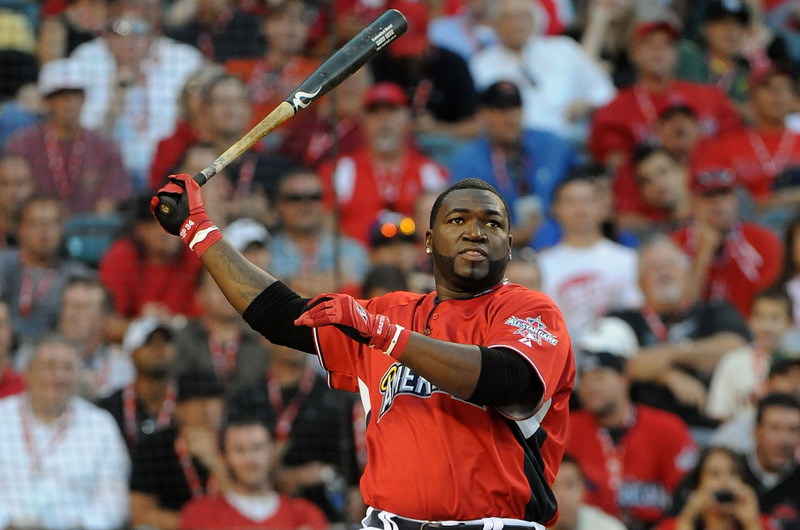 For the American League, Ortiz picked Boston teammate Adrian Gonzalez. That by itself doesn’t seem harmless, but is well within the scope of powerful swings that could send more than a few balls spinning high into the night sky. Ortiz then selected two fellow Dominican Republic stars from American League East divisional rivals, New York Yankee second baseman Robinson Cano, and Toronto’s Jose Bautista. The selection of Bautista is warranted considering his slam-tastic 2010 season, and his 31 Home Runs in 2010 make him a viable threat of launching one towards the Moon with every swing. But the selection of the charismatic Dominican Cano might be reaching a bit here. Sure Cano has hit 14 round tippers, but that total is easily shadowed by his own pinstripe teammates Curtis Granderson and Mark Teixera who each have 25 dingers coming into Sunday’s final games before the break. 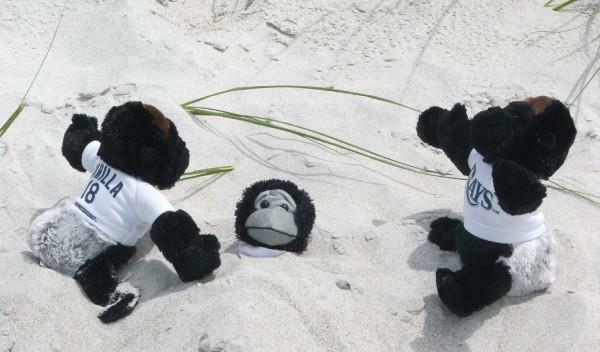 The “Buddy” system seems alive and well in the A L East thanks to Ortiz for the Home Run Derby. Possibly mixing it up a bit and including Texas Nelson Cruz ( 20 HR) or maybe even Final Vote winner White Sox’s Paul Korneko (22 HR) would make a more well-rounded squad. But Fielder also made a few visible faux pas of his own by looking past Upton who might only have the same number of Home Runs (15) as his older brother B J at this moment. But this All Star Game is Arizona’s time to shine, and omitting Upton to the Home Run Derby party just seems wrong in so many ways. 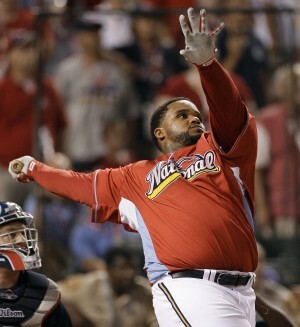 Fielder also included his Brewers teammate Rickie Weeks in the pot along with Cardinals OF Matt Holiday to making a 3-man NL Central core to his squad. Only Dodger Matt Kemp has kept this from also being an exclusive squad within both Fielder’s and Ortiz’s divisions. Missing from Fielder’s choices are guys like Lance Bergman (24 HR) or even perennial Home Run Derby stallion Phillies First Baseman Ryan Howard. The change was meant to possibly include some names not usually associated with this event, but has been turned into a admiration society between the 8 competitors. That is not a bad thing to do if you are hosting a celebrity charity Home Run event, or even a golf tourney. 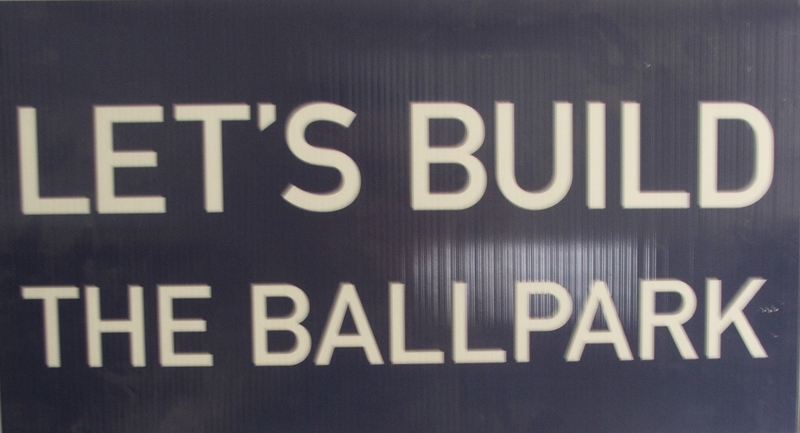 But it doesn’t belong within the structure of the Home Run Derby. 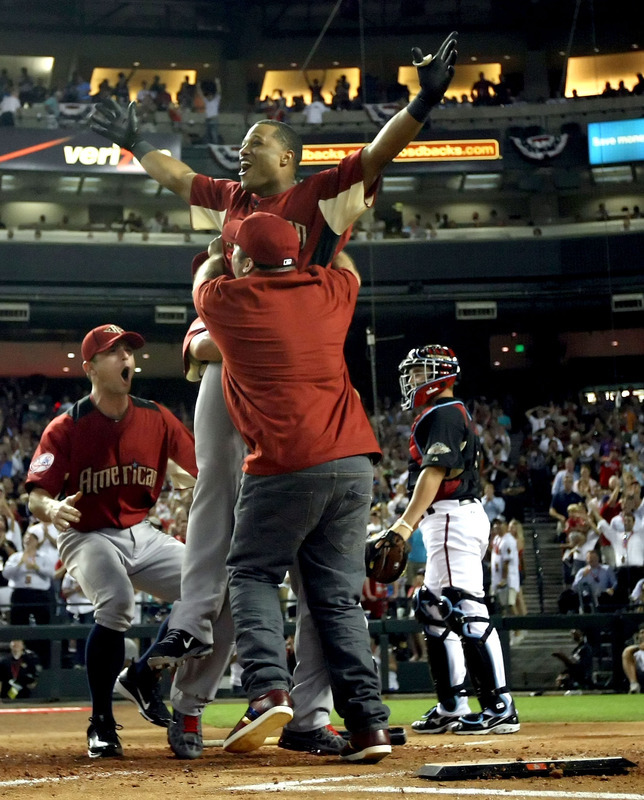 Home Run Derby contestants should be a cross-section of your League, not your friends/teammates. How interesting that the upper echelon within the M L B office has decided to part with a bit of their Mid-Season Classic gold. More compelling is that now more M L B inspired ballhawks will be descending upon Arizona with hopes of plucking the “golden goose” from the outfield confines. I want to know who the genius was the devised dipping a panel of the M L B regulated Rawlings leather panel in a bath of 24 karat gold. 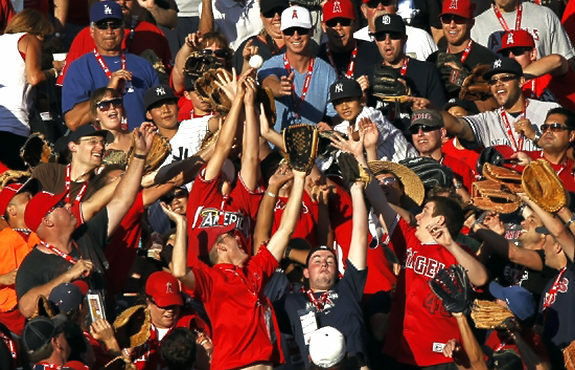 Think of the proud thrusting up of each arm as a $ 149.99 gift from the baseball Gods is delivered into their leather, nachos or even baseball cap during the “Golden” rounds of the Home Run Derby. Think of the possibility of someone swimming or snorkeling adventure within the Chase Field outdoor pool be supplemented by a possible golden orb sinking to the pool depths. Hope the lifeguard is packing a glove that night. But in the end, the Boys and Girl’s Club will be the winners in the Golden Ball segment of the final out of each hitter’s appearance. Even as each outfield/stadium fan throws up their prize, the Boys and Girl’s Club will see their account upgraded by $ 18,000 with each Golden orb traveling beyond the walls. Make me wish I had the extra cash and time to zip right on over to hot and humid Arizona and partake in a quest for a golden orb of my own. Only downside to the event might be the fighting and struggling for each golden missile that transcends into the stands, and hopefully at least one kid will get the treat of a lifetime with a great snag. Wonder if MLBlogs own Zack Hample has figured out the right spot, or the right angle to possibly get one of the prized Home Run Derby balls. 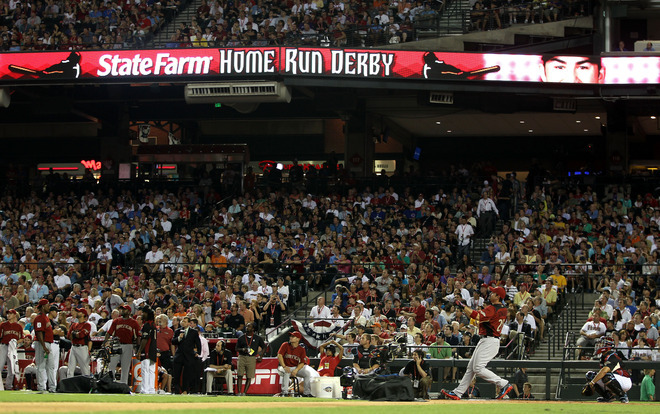 M L B tried two news changes to the State Farm Home Run Derby, possibly striking out with the first. The Golden Ball will go over great with the fans and the assembled army of ballhawks. They still need to work on the Home Run Derby selection process, and I will address my idea for the future selection process tomorrow. So M L B has a current 1-ball 1-strike count of them……Hopefully no fighting in the stands or goose eggs by the selected players put this event into a controversial spotlight for negative web fodder. Hopefully the event will turn out simply…….Golden. Before 2007, there might have been minimal discussions before the Tampa Bay Rays buckled down and ultimately decided to partake in a day/night doubleheader this Saturday with their bitter rival, the New York Yankees. In a move that shocked some within the Yankees organization, the Rays did an about face and rejected every intention and submission to “play two” for any reason on Saturday. 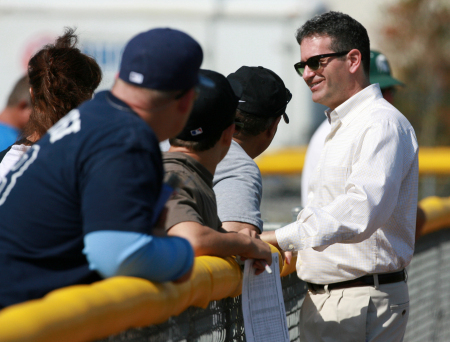 People forget that the Stuart Sternberg and Rays Vice-President of Baseball Operations Andrew Friedman have evolved this same Rays laughingstock into a more refined and calculated risk management based organization that does due diligence on every single minute detail. Such a double dose of baseball taxes an already tired and walking wounded Rays club heading into the All-Star break. 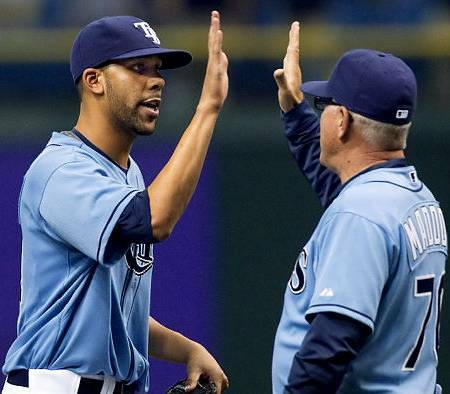 It also put into play a few sinister and equally positive scenarios that could favor the Rays. By vetoing a doubleheader, even in the traditional sense, the Rays can by-pass young hurler Jeremy Hellickson and instead position top pitchers David Price and James Shields to take the hill in the last 2 contests before the break. By sending their best arms into the fray, the Rays can possibly with 2 victories pull close to the Yankees, plus give themselves a great emotional cushion heading into the second half of the season. Sure the departure from usual Major League Baseball fiscal logic to get the games done might seemed a bit biased to the Rays side at this moment, but it actually might play into the Yankees court come September. 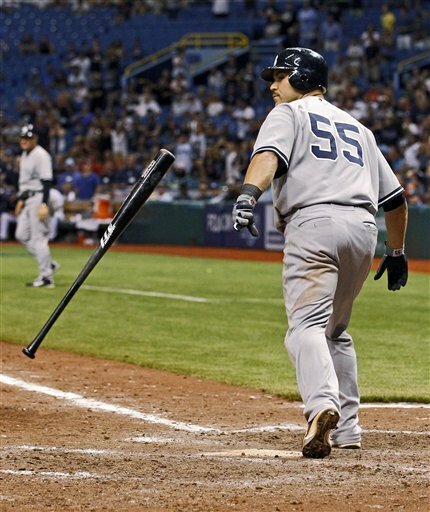 With a proposed make-up date of Thursday, September 22, 2011, the Rays will already be in town after completing a 2-game set against the Bronx Bombers. Lost in all the impending current drama plus pomp and circumstance surrounding Yankee Captain Derek Jeter’s “Quest for 3,000” is the fact the Yankees right now have their own “walking wounded situations. We all know of the recent plight of Jeter, but the Yankees Bullpen is currently not up to snuff with the revolving injury bug hitting from set-up guys to their closer. The Rays might actually be giving the Yankees a hidden break by letting them “get healthy” instead of pushing their Bullpen through multiple game situations. With their late inning executioner Mariano Rivera watching from the bench, it would be the perfect time for the Rays to possibly “steal one” from the Yankees, but that is also not this new Rays regime’s style. So as you Yankee fans are cursing out Rays Manager Joe Maddon and the Rays organization this weekend over possibly ruining the Jeter parade, remember it was the Rays who also used their pitching to delay Alex Rodriguez’s march to 500. With the Rays refusing a day/night doubleheader, it ups the ante that Jeter will have to get his cherished hits in the next 2 contests against the Rays best pitchers. In hindsight, Jeter would possibly want to get it against 2 of the better hurlers in his division than wait until going into Rogers Centre against the Toronto Blue Jays after the break. By the way, after the Jays, the Yankees come into Tropicana Field. 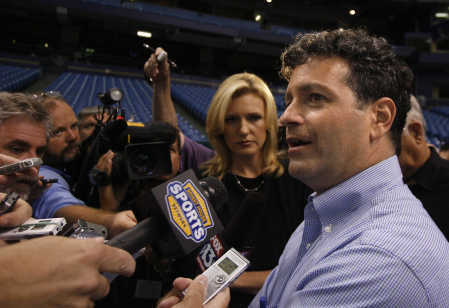 This Rays franchise has grown a lot since the days of being the AL East doormat, and possibly this is another firm example of the type of team/organization this has become since former owner/founder Vince Namoli and ousted G M Chuck LaMar left the building. I actually think it was a stroke of subtle brilliance, and I give credit to Maddon and Rays Vice President of Baseball Operations Andrew Friedman. Most M L B Clubs might have accepted the day/night duo of games without incident, but the Rays challenged the process and rejected the norm. Soon enough we will find out if the cards played in the Rays favor, or the Yankees. Spoken like a true rebel to the norm….and I like it! With “Crunch Time” descending upon the M L B World quickly, I am going to put out a plead, a request, a recommendation as to who I believe should get the final roster spot for the 2011 American League All-Star slot. Of course I am going to be pushing the name of Tampa Bay Rays OF/INF/ Uber-Fielder Ben Zobrist for this selection. Sure Detroit’ DH/C Victor Martinez will have the Tigers all roaring his name. The South Side of Chi-town will hail DH Paul Korneko’s stats to the heavens. Down by the Inner Bay in Baltimore, the O’s faithful will christen CF Adam Jones their unlimited votes, while Royals fans will try to push 3B Alex Gordon out of obscurity to claim the last spot on the 2011 American League All-Star squad. 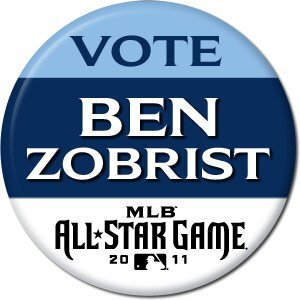 Hopefully by the end of this blog entry I will have amply persuaded you to toss the rest of your voting selection towards Zobrist until the conclusion of voting late Thursday. So without further ado, let me state my case for Zobrist. 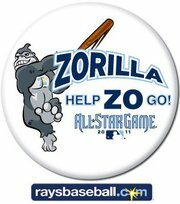 First and foremost, with a nickname like Zorilla, how can you not cast your vote his direction. Since 2008, this hybrid M L B player who has done everything on the diamond but catch and pitch has evoked the power of Godzilla and the finesse of Zorba the Great. The nickname alone would have ESPN broadcasters giggling like little school girls. Out of the final 5 selections, only Martinez and Zobrist are switch-hitters that could be used against any of the National League hurlers. The added bonus of Zobrist being able to switch from any infield or outfield position with just a glove change makes him a double threat, and a nice secret weapon for the late innings when guys are shuffled around a lot. Martinez would be mostly a DH selection, which would be moot since the game is held in a N L park. Zobrist is always a double threat at the plate. 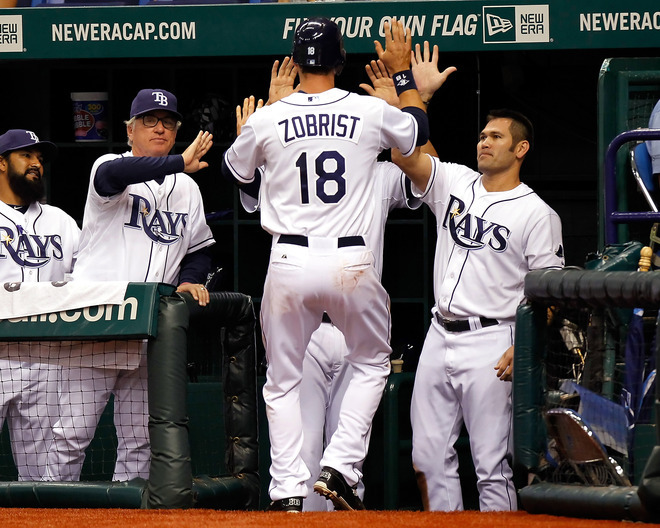 Zobrist hit his 28th double on Tuesday which ties him with AL All Star 1B Adrian Gonzalez for the M L B lead. Zobrist lead the majors with 12 doubles in June, and has 11 2-baggers in his last 21 games. At one point (June 17-20th) Zobrist doubled in 4-straight contests. Add to this list that Zobrist is also in a 4-way tie with 4 Triples this season and you see that he can be a run producing machine at this time. Some will throw the fact that Martinez is hitting .324 at this moment, or Konerko has 22 Home Runs and 64 RBIs. Power is great, but these two players also do the most damage as either First Baseman or Designated Hitters, and as I stated before, this position is moot in an NL park. If you want to talk about solid defense, then again we must chat a bit about Zobrist. 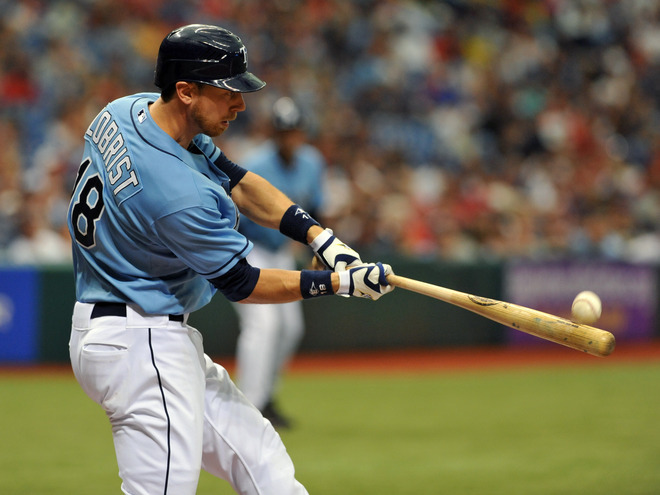 In his 223 career starts in the Rays outfield, Zobrist is still without a single error. Considering the ballpark he plays in at home, plus his constant adjustments to new parks and his evolution as an outfielder, that is an incredible stat. With his ability to play every position on the diamond, or out in the field (besides catcher), the versatility of Zobrist makes him a clear choice as the other 4 candidates have defined roles and positions. Heck, I personally know he will dive into the stands for a foul ball. You will Remember this! Let me again harp back on Zobrist’s Extra Base prowness this season for a moment. At this juncture in the season, Zobrist currently has 41 Extra Base Hits. He had a total of 40 for the entire 2010 season. That total of 41 XBH ranks him 7th in Major League Baseball at this very moment. Add the bonus that 7 of his 9 Home Runs have come off of Right-handed pitching, and you get a nice pinch hit option off the bench for Washington. Who could forget Zobrist’s memorable 10-RBI game back on April 28th against the Twins in Target Field. Zobrist also went 4 for 5 with runners in scoring position in that game. He ended up collecting 18 RBIs in 5 games. The last hitter to collect 18 RBI’s in 5 contests was Reggie Jackson (June 14-18 1969). I could go on and on with the accolades, a prior All-Star selection ( 2009) and the potential Zobrist has to be a key component in this contest that decides home field advantage for the 2011 World Series. This is very important, and was evident in 2010 as the San Francisco Giants rode a winning streak in Arlington, Texas all the way to their first championship since the team embarked for the California coast. Ever since the Florida Marlins proudly announced their plans to build and relocate the team into the heart of the Miami metro area, you know the Tampa Bay Rays have been a bit envious of their Citrus Series rival. It has not been an easy road for the Marlins, but in the end it will be a prized locale and a stadium worthy of the lofty investment. With their new abode also comes a name change to the Miami Marlins, finally bringing their community name to the front of the Marlins jerseys. Already their have been rave reviews on the shell configuration of the complex, and even a recent Marlins batting practice “ showcase” in which more than a few pitches thundered off the bat into the current vacant spaces in deep Centerfield. The retractable roof would save the suspect of rain-outs, which had happened 191 times since the team first took the field 16 mile north. 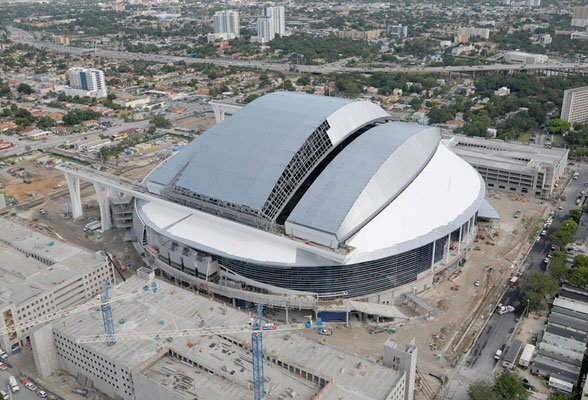 Now the Marlins could open or close the roof at will, forever banishing the elements to the exterior. 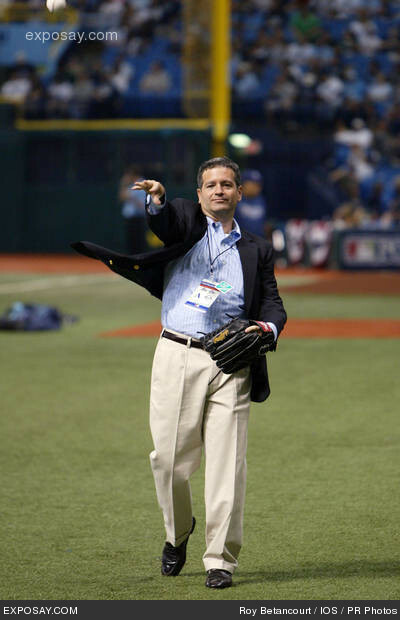 You know the Rays are really jealous of the fact the Marlins got their financing and approval intact before the economic downfall that might thrust the Rays into more privately invested waters instead of tapping the public side of the equation. 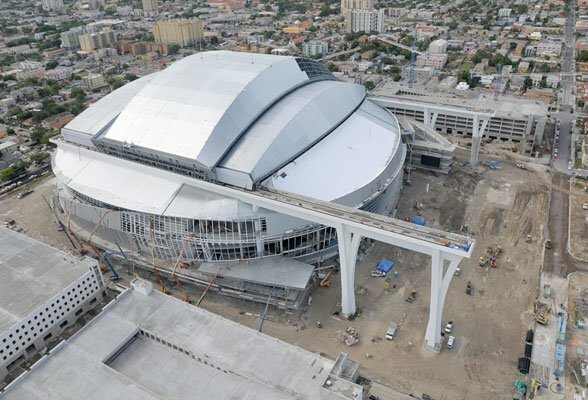 With the Marlins Ballpark’s current operations running on budget and on-time for the 2012 completion mark, the Rays still sit in total limbo in their own stadium dreams. As if the Rays needed to be strung anymore by the Marlin’s success, people within the “Marlins inner circle” have been “ unofficially” whispering enthusiastically around the community that Marlins Ballpark will host the New York Yankees in the team’s last 2012 Spring Training contest as a rehearsal for their April 4th M L B home opener against their Spring Training roommates in Jupiter, Florida, the St. Louis Cardinals. I still think one of the surface smart decisions of this stadium configuration has been the future Marlins cutting back their official capacity to 37,000 which will make the stadium capable of possibly dishing out a few sell-out contests in 2012….a rarity in South Florida right now. The reduced capacity does come with a glaring possibly Catch-22 situation that their stadium will have the smallest actual capacity within Major League Baseball. That could dampen and drown possible chances for the Marlins getting overall M L B approval for such events as the 2015 All-Star game. This mid-season celebration is a coveted prize, but one that could slip through the Marlins fins as a result of a reduced chance for M L B to cash in totally on a huge crowd. If the Marlins do get their All-Star game, it solidifies the Rays also wanting to have a possible reduced seating capacity facility. 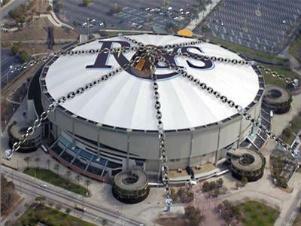 If the Marlins are trumped, it will show the Rays that possibly a 40,000 seat stadium in a must to get such events. 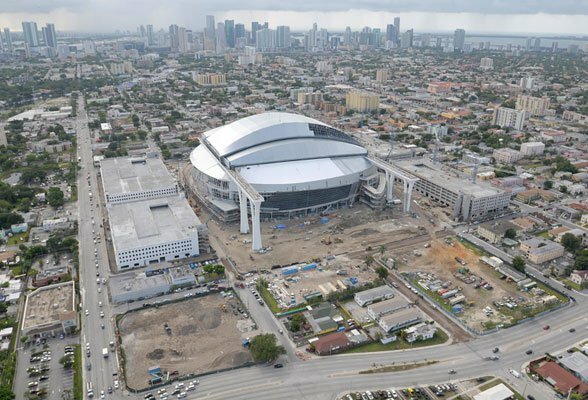 As the stadium has risen on the Miami horizon, there has always been doubt or speculation that the Marlins could bring the masses into their new home. The inclusion of a Metro rail line and increased public transit will also be closely watched by the Rays. It has been envisioned by so many in the past that the Rays future stadium and their success might also hinge on transit and the ability to bring people to the ballpark without huge traffic concerns. The Rays organization has to be monitoring this Marlins Ballpark transformation with eager hearts and minds. So many of the same unforeseen variables the Marlins face, the Rays currently share the same anxiety and stumbling blocks. Odd that once again as in the initial M L B expansion into the fertile Florida market the Marlins will be the first to dive in and see what floats. The Rays front office has to be frustrated and perplexed that their own community could not harness the same lighting bolt energy that got the Marlins their dream stadium. Political unrest, posturing on both sides of the Tampa Bay estuary has brought rough waters even to beginning honest discussion and proposals. As public funds are being drained like the Florida aquifer, the chances of a highly public funded stadium are sinking into the quicksand. Suddenly it seems the Rays stadium situation might be on the agenda soon within the closed confines of the M L B ownership. M L B Commissioner Bud Selig has postured in the past, even during a reception under the Teflon roof of Tropicana Field that the Rays need a better facility, but the Commissioner’s voice went silent to many movers and shakers within the community Soon the words will end and some harsh realities will resurface for all to see and judge. Time has past for this Rays stadium chatter to begin, the Florida sands of time ate quickly falling from the top of the hourglass. I plan on buying a ticket for the Marlins home opener. I might not attend it, but it is a valuable piece of Florida baseball history. 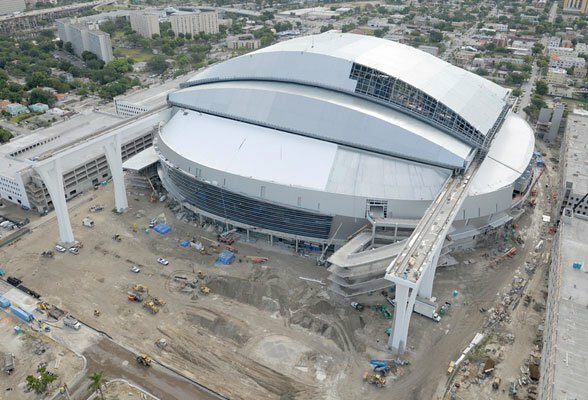 If the Tampa Bay community leaders do not quickly put their community pride and judgment in check, it might be the last M L B stadium built in Florida for a long, long time. Most people forget, baseball is a business and when the book begin to show more red than black…changes happen quickly…..even in the slow moving South.